Port City will be a fantastic addition to the city economy. Obviously daily commuting will become an issue with large influx of people. A form of overground/underground city train will be required. I think transport sector itself requires reform. There are too many competing bus companies at present. The cut throat competition creates a lot of accidents, pollution and traffic. Legislation should be introduced such that each company must have a minimum of 500 vehicles in their fleet. The routes can then auctioned off. That will bring some order to private bus chaos. How much has Pathala Champika been paid to make such a stupid statement? A proper environmental impact assessment needs to be done and that takes time. We also need to know where the earth, rocks and sand, to fill out the Chinese land is going to come from. Already sand mining for various white elephant development projects has caused floods and land slides and environmental disasters for people living in those areas. Disaster risk expertise from UNDP and Ministry of DIsaster Mangament which is rather a joke must be got. Not only an environmental impact assassment but consider the recent massive chemical explosion which happened in Tanjin in South China, which completely destroyed many businesses,factories, residences and the transport infrastructure there and all news about hushed up by the authorities, what would be the risk Colombo city would have to cope with in such an eventuality? In reality this Project is a huge economic development boost for Sri Lanka and the only ones against it have other agendas or interests ie like a colleague of mine recently admitted he was actually against it because he feared that his new apartment he purchased in the heart of Colombo would loose out in value. Any development we do has an environment impact including building a house. I think if we go back to the stone-age then we should satisfy the critics. Will China own land in Srilanka? That has to be mad clear. Will China have the Rights of Aerial space too? Bad for Srilanka if they have Rights ABOVE the Port city. Now what? Another broken promise or shooting off ones mouth pre election? This is the way most hasty prounouncements go! The Chinese must be also twisting arms. What about the environmental concerns about sea erosion along either side. The land allocated to China on a perpetual lease is also serious concern. The big question is whether we need this land for commercial development. Why not make the area an extension of thw Galle face green, now that the groind work has been done? Of course the Chinese twisted arms. They have investments across the globe especially in African/S.American and Asian nations. they know how to sign deals that are almost impossible to get out of. I also wonder if Champika is promoting this given his anti-indian feelings…. Actually China and India are no threat to this island. and 60 organisations under the front Jathika Ekamuthuwa (National Collective). Plans to privatise free health, education and commodify water. Sinhalese and Tamils are the only two people who consistently turn opportunities into disasters. Yes, we are very good at shooting ourselves in the foot but love to find scapegoats all over the world. Do you genuinely think that project proponents did not care a damn about their investment in trillion plus and allowed this so called bogey called environment to haunt them!? We know this is not the first project of nondescripts. Neither is it their first in the world. We build port city and store banana this time, Cheers! poor sri lanka. First step to say Sec.Kerry at US congress that Lankawe has cheated him. He said in Colombo whatever can happen the LTTE has been defeated. There must be a lot of cringing going on at the US embassy in Colombo right about now ! are we locals able to get a visa to go in there? have we got to marry a chink to get permanent residency of port city. If a chinese knocks up one of our local girls can she get in there and confront him with the baby?Will the dad who accompanies her be thrown out bodily on to the street?If the woman goes missing will minister give guarantee that he will do the needful?I mean not knock her up again,but find her. Will the chingalese be given dual citizenship? These are the questions to be put to chumpika ranawake. One of the more blatantly bigoted posts I have seen on CT in awhile. Congrats ! the details of this 1.4 billion USD project is not in the public domain.Did you wonder why?We bigots would like to see it to get rid of our bigotry. when the old bloody fool king of troy saw a towering beautiful wooden horse left on the beach by the greeks he thought what a gift it was and towed it into the city.The rest is history. Hit the Nail on the Head!- Entry Point for the Chinese. Best news for a long period of time. 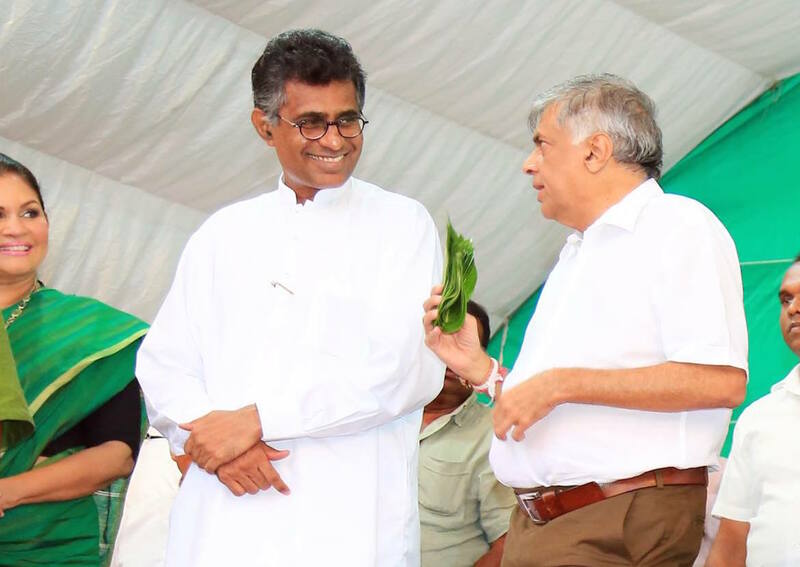 Champika has the taste of Nooraichcholai. He built to for 580M US$ when China wanted only 240M US$ in the first palace. For that cost they installed it with condemned machinery of China. When it was not functioning and breaking down many times inaddition to China’s demand for loan payments, they approached India to repair it. You know what it means. They thought it will scare China and make it to fix. China did not want to fix it, but demanded that to be handed over to it. This is how not just India, even US, Britain… any other countries inspecting it projects can be stopped for once and for all. Lankawe tried to Cheat China on the loan, instead handing over the plant. [Edited out] They changed the Land ownership laws to accommodate China to posses the plant Land. Then they took a contract with China to maintain the State departments’ computers. Bravo! With that kind of experience, Champika knows what will happen if you fool around with China. He knows China is not India nor UNHRC. He just like the commission, instead of troubles. completed while work on the Port City is on so that heavy influx of people to the Port City, at all times could be managed once it is opened to public. A feasibility study should be made to find out, before work starts on the Port City whether the project is manageable without creating traffic chaos in the cities from Panadura to Colombo fort. Lets not do a “Mattala” again and waste people’s money. Hope there was no arm twisting by China for an early start and wonder whether Indian permission obtained !!. SO! The only reason you canvassed against Rajapaksa was because you were ignored by him. You have stolen Rajapaksa’s projects and going to do so well with it! Let’s just say that your expertise in all tings green and environmental and post-modern, shouldn’t have been ignored by Rajapaksa. It is a relief that that land-bridge to India would probably not be built. Make sure that that definitely will NEVER happen within all the chauvinism you can muster(guess a bit of chauvinism is needed in these, the times). Rajavassa project? Tell me one project which is benificial to the country? Few days ago one cabinet Minister told media with resopnsibility that they would re start Port Project only after black and white signatures of relevant professionals granting approval upon Environmental Impact Assessment. How did they took a decision on serous issue propmptly? “MARAI”. Vasudeva and the rest of the gang of 4 plus DJ will have not only the Gallery Face Green but also the free hold land of the Chinese in the port city to fly kites. They will also be made life honorary members of the Golf Club within the port city. This project is run by Chinese “MAFIA” under the cloak of CCCC. Palms have been oiled again. Corruption in china is rampant. Sri Lanka will be further indebted for decades. IS it going to be another norchial power plant? MAttala rajavassa airport? Hamabantota rajavassa port? Hamantota rajavassa cricket stadium? You stupid moron norchial power plant was build when you were the minster. Do we trust with your decisions NOPE! We need a enviormental study and it should be public. We need to know any free air space or land will be given to china? Another white elephant in sri lanka. sTUPID IDIOTS! This Government also seems to be thinking along the Megalomaniac ideas of the Previous One. Don’t they realise that the next Tsunami will Wash all those US $1.4 Billion back into the Sea? Sri Lanka does not need ‘Mega Projects’ in the Western Province, at the moment. We Just need the Improvement of the Infrastructure and Water Conservation Projects in the Dry Zone Areas of the North, North Western and Eastern Areas of Sri Lanka. Our Ancient Rulers were able to Think in a Creative and Environmentally Friendly Manner. Pacha Ranawaka is smelling $$$$$$$$$$$$$$$$$$$$$!!!! BTW… how was the budget for the MAtara -Kataragama railway increased by $100 million by the my3 govt??????? ?